The Silentnight Ultrabounce pillows are very much a budget-friendly pillow. But unfortunately that comes at a cost, and that cost if longevity. Ultrabounce pillows are comfortable when you first get them but do lose some of their bounce as time goes by. Confused as to why they’re called Ultrabounce if that’s the case? Well they have a special filling that means they bounce back after they’re washed. Which is excellent if you need to wash your pillows often if they’re on a child’s bed for instance. And they have a 2-year guarantee so you definitely get some good life out of them. I’d recommend sleeping on two of these if you’re a back or side sleeper but just one if you’re a front sleeper. Overall, not a bad pillow for the price, definitely better pillows out there but if you’re on a budget then it’s a great choice. 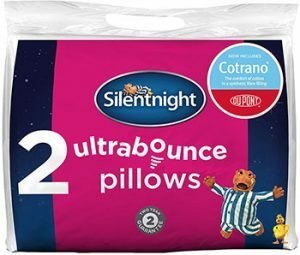 Silentnight have now created a luxurious Ultra bounce Pillow, wrapped in soft microfiber, offering spring-like, hypoallergenic Cotrano fibres from DuPont, with all the softness and comfort of cotton. Cotrano is also incredibly resilient, meaning that your pillow will bounce back into shape however many times you wash it, enabling Silentnight to offer you a full two-year guarantee.